Robert Martinez was born in Wyoming on the Wind River Reservation in the small city of Riverton. He grew up a part of many different cultures as his lineage is Spanish, Mexican, Scotts Irish, French Canadian and Northern Arapaho. He graduated Riverton High School at 17 and through a scholarship, attended the Rocky Mountain College of Art & Design. 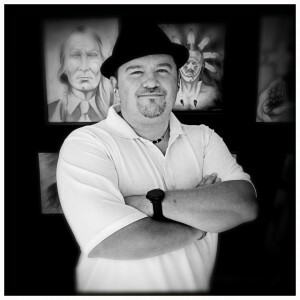 He graduated with a Bachelor of Fine Arts specializing in Painting & Drawing and minoring in sculpture. In 3 years and at age 19, he became the Youngest Native American to graduate from RMCAD at that time. As he was brought up in the center of the reservation, his native heritage remains a constant inspiration and source of ideas for his work. Living in among the hard working people of the West and experiencing their issues also deeply influence his creations. The past and present resonate strongly in Wyoming and those historical and contemporary chords echo throughout his pieces. Much of Robert’s current work uses the historical imagery, myth’s and stories of the West & Arapaho Culture combined with modern themes to create images that have a statement on the issues of today. Using intense vibrant color and contrasting shades of light and dark, he paints and draws striking forms that are confronting and engage the viewer. His paintings and drawings have been shown across the Nation and have garnered noted acclaim. His work is included in the permanent collections of the Red Cloud Heritage Museum, Plains Indian Museum at the Cody Center of the West, and the Smithsonian National Museum of the American Indian. A strong supporter of Education and of the Arts, Robert devotes time to helping and mentoring emerging artists on his reservation in Wyoming and the western region. He gives back to the community by speaking about art topics, giving workshops, and demonstrates his style to schools, agencies and art groups.